Global house prices increased by just 0.3% on average in the year to the end of March but this hides the significant disparity between world regions. Kate Everett-Allen examines the latest figures. 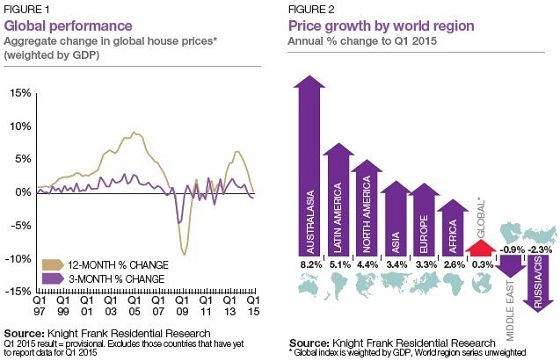 The Knight Frank Global House Price Index increased marginally by 0.3% in the 12 months to the end of March 2015. The Global House Price index recorded its weakest annual growth for three years, rising by just 0.3% in the year to March 2015. Weighted by a country’s GDP, the index ensures countries such as China and the US have a greater influence than much smaller economies such as Jersey and Malta. With some of the larger economies such as Japan, France and crucially China all experiencing housing market slowdowns, this is masking the fact that overall we are seeing more sustainable growth amongst a larger number of countries. Around 75% of countries tracked by the index recorded flat or positive annual price growth in Q1 2015, three years earlier this figure was closer to 47.2%. Hong Kong leads the annual rankings this quarter with mainstream prices ending the year nearly 19% higher in March. A lack of supply along with the popularity of smaller apartments due to affordability constraints is behind the acceleration in mainstream prices. Russia and the CIS represent the index’s weakest-performing world region with prices down 2.3% year-on-year, Ukraine’s fall of 15.5% in annual terms having a significant bearing. European countries which claimed almost exclusive rights to the bottom half of the rankings for several years are now more evenly spread with seven of the top ten countries now located in Europe. 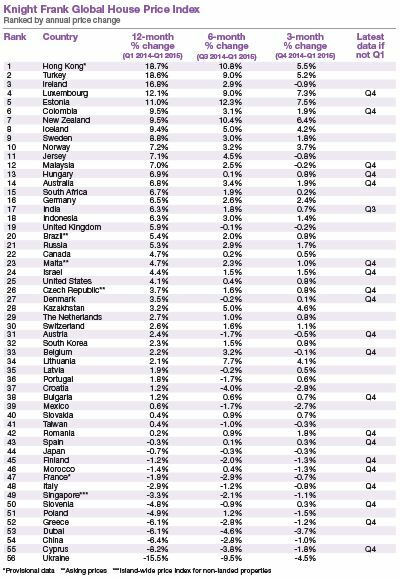 Turkey, Ireland, Luxemburg and Estonia rank highest, all registering double-digit annual growth. But a two-speed Europe is increasingly evident. Cyprus, Greece, France and Italy sit amongst the 10 weakest-performing markets, notable by their absence however are Spain and Portugal. Prices in Spain are now rising at their fastest rate in six years due in part to improved mortgage lending. The two bellwethers of global housing economics, China and the US, are pursuing divergent courses but for how long? While prices continue to soften in China (down 6.4% on average year-on-year) the volume of sales rose 7% year-on-year in April on the back of looser monetary policy. The US, on the other hand, recorded 4.1% growth in the year to March but with underlying inflation still rising a rate rise is expected later this year. The Knight Frank Global House Price Index established in 2006 allows investors and developers to monitor and compare the performance of mainstream residential markets across the world. The index is compiled on a quarterly basis using official government statistics or central bank data where available. The index’s overall performance is weighted by GDP and the latest quarter’s data is provisional pending the release of all the countries’ results.